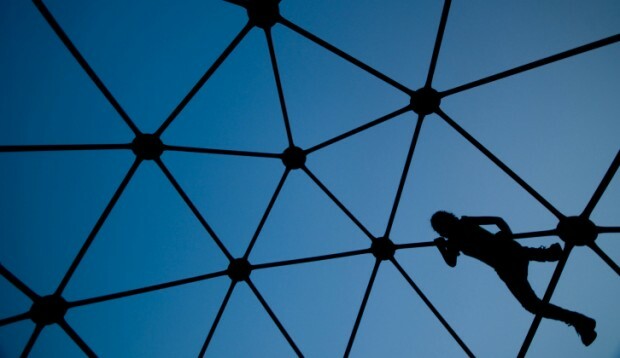 How can we best prepare children and adolescents to thrive in the 21st century? This question is at the heart of what every educator attempts to do on a daily basis. Apart from imparting content of knowledge and facts, however, it's becoming clear that the "noncognitive competencies" known as grit, perseverance, and tenacity are just as important, if not more so, in preparing kids to be self-sufficient and successful. 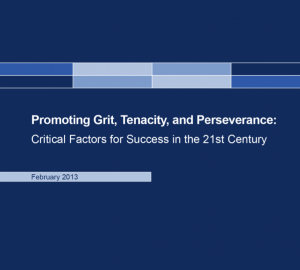 To that end, the Department of Education's Office of Technology has released a report called Promoting Grit, Tenacity, and Perseverance —Critical Factors for Success in the 21st Century, drafted by research firm SRI International, which addresses how educators can integrate these ideas into their teaching practice: Are these competencies malleable and teachable? How significant a role do they play in students' success? What are the best learning environments to encourage and foster these attributes? "The test score accountability movement and conventional educational approaches tend to focus on intellectual aspects of success, such as content knowledge. However, this is not sufficient," the report states. "If students are to achieve their full potential, they must have opportunities to engage and develop a much richer set of skills." The entire report [PDF] is well worth the read. Here are a few noteworthy highlights excerpted from different parts of the report. What Are Grit, Tenacity, and Perseverance? Sociocultural context plays an important role. It can be a significant determinant of what students value and want to accomplish, the types of challenges they face, and the resources they can access. It is well documented that students from high-poverty backgrounds are particularly likely to face great stress and limited social support for academic achievement— factors which can undermine perseverance toward a wide range of goals. Researchers and educators also highlight concerns about the challenges faced by students from other segments of the socioeconomic spectrum. For example, researchers and educators are exposing how grit can be detrimental when it is driven by a fear-based focus on testing and college entry. This can undermine conceptual learning, creativity, long-term retention, mental health, and ability to deal with “real-world” challenges. Effortful control. Students are constantly faced with tasks that are important for long-term goals but that in the short-term do not feel desirable or intrinsically motivating. Successful students marshal willpower and regulate their attention during such tasks and in the face of distractions. While this can seem austere or “no fun,” research shows that students stronger in these skills are happier and better able to handle stress. Strategies and tactics. Students are also more likely to persevere when they can draw on specific strategies and tactics to deal with challenges and setbacks. They need actionable skills for taking responsibility and initiative, and for being productive under conditions of uncertainty—for example, defining tasks, planning, monitoring, changing course of action, and dealing with specific obstacles. There are many different types of measurement methods, each with important tradeoffs. Self-report methods typically ask participants to respond to a set of questions about their perceptions, attitudes, goals, emotions, beliefs, and so on. Advantages are that they are easy to administer and can yield scores that are easy to interpret. Disadvantages are that people are not always valid assessors of their own skills, and self-reports can be intrusive for evaluating participants’ in-the-moment perceptions during tasks. Informant reports are made by teachers, parents, or other observers. Advantages are that they can sidestep inherent biases of self-report and provide valuable data about learning processes. The main disadvantage is that these measures can often be highly resource- intensive—especially if they require training observers, time to complete extensive observations, and coding videos or field notes. School records can provide important indicators of perseverance over time (e.g., attendance, grades, test scores, discipline problems) across large and diverse student samples. Advantages are the capacity to identify students who are struggling to persevere and new possibilities for rich longitudinal research. Disadvantages are that these records themselves do not provide rich information about individuals’ experiences and nuances within learning environments that may have contributed to the outcomes reported in records. Behavioral task performance measures within digital learning environments can capture indicators of persistence or giving up. Advantages are that new methods can be seamlessly1 Some people equate “dispositions” with traits that people are born with and/or cannot change. In this brief, and particularly in the context of measurement, we use the term to mean enduring tendencies, independent of any claims about their origin or malleability. The extent to which dispositions are changeable, malleable, or teachable will be highly dependent on what the disposition is and the nature of the opportunities that individuals encounter. We reviewed approximately 50 programs and models for promoting grit, tenacity, and perseverance, and developed five conceptual clusters based on targeted age level, learning environment, and which facets of the hypothesized model are addressed or leveraged. While there is still a need for more empirical evidence that these factors can be taught as transferable competencies across situations, there are a wide range of promising programs and approaches. The five conceptual clusters are as follows (discussed in detail in Chapter 4). School readiness programs that address executive functions. These programs at the preschool and early elementary school levels help young children develop the effortful control that is necessary for the transition into formal schooling. Approaches include training with games, aerobic exercise and sports, martial arts and mindfulness practices, and classroom curricula and teacher professional development. Many programs have substantial empirical evidence of their success, and a major finding is that children best develop attention regulation and self-control when they can practice skills in a supportive environment that addresses cognitive, social, and physical development together. Interventions that address mindsets, learning strategies, and resilience. There is growing research demonstrating that brief interventions (e.g., 2 to 10 hours) can significantly impact students’ mindsets and learning strategies, and, in turn, academic performance. 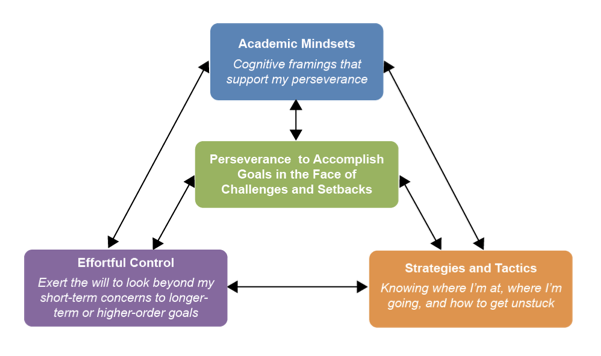 Empirically based mindset interventions include activities that explicitly teach students to have a “growth mindset” (i.e., that intelligence grows with effort), help students frame difficulty not as personal failings but as important “bumps in the road” on the way to success, provide students opportunities to affirm their personal values to maintain clarity about why they are investing their efforts, help relate course materials to students’ lives, or incorporate multiple approaches to address different needs. Empirically based learning strategies interventions include those that help students clarify their goals and anticipate in advance how to deal with likely obstacles, develop general study skills, build a resource-rich social network, or develop content-specific metacognitive skills to monitor progress. Some programs build these types of skills as protective positive assets that support resilience in the face of adversity. Alternative school models and school-level reform approaches. We reviewed three types of approaches. The “character education” models include explicit articulation of learning goals for targeted competencies, clear and regular assessment and feedback of student progress, intensive teacher professional development, and discourse about these competencies throughout the school culture. In the “project-based learning and design thinking” models, students develop competencies through engagement in long-term, challenging, and/or real-world problems that require planning, monitoring, feedback, and iteration. Mindsets are addressed inherently in processes of feedback and iteration, and projects are often aligned with students’ interests and passions. The third type of approach is that of organizations providing support for schoolwide improvement, such as teacher professional development, networks of school communities, and strategies to improve school organizational structure. There is strong anecdotal evidence of these models’ success, but further research is needed to determine impacts. Informal learning programs. We reviewed informal learning programs that provide different kinds of support for persistence. Several provide structured social support networks for students who are the first in their families to go to college. Such programs provide academic support, community involvement, and guidance in the processes of college exploration, application, and initial college adjustment. Other types of programs focus on activities to spark and support interest and persistence in STEM professions. Many programs are beginning to teach explicitly about grit, drawing on models similar to those discussed in the character education models above. In most cases, there is strong anecdotal evidence of their success, but further research is needed to determine impacts. Digital learning environments, online resources, and tools for teachers. We reviewed educational technologies aligned with each aspect of the hypothesized model: digital learning environments that provide optimal challenge through adaptivity; digital tools to help educators promote a rigorous and supportive classroom climate; resources, information, materials, tools, or human capital to accomplish difficult goals; motivating learning environments that trigger interest; teaching about academic mindsets; promoting learning strategies; and promoting the development of effortful control. Data is available showing impacts of many of these technologies. When students have big and important goals, educators can promote perseverance by providing support. Just as there is an array of types of goals, there is also a wide variety of challenges, setbacks, obstacles, and adversities that students may encounter in pursuit of their goals. We first examine this variety of challenges, and then take a close look at two dimensions of learning environments that can be important for supporting perseverance. Conceptual complexity or lack of tactical knowledge. When the goals are around learning content, many students are challenged by the conceptual complexity. Students may also be challenged by lack of tactical knowledge about how to handle new or large goals that require planning and monitoring, for example, a long-term inquiry-based science project or taking the steps necessary throughout high school to get into college. More dominant distractions, lack of intrinsic motivation, boredom. No matter how worthy a long-term goal may be, students will encounter particular subtasks or periods of time when other activities, such as surfing the Internet or hanging out with friends, may seem much more attractive in the short-term. Inevitably, students face choices about how they will spend their time and focus their attention. Lack of resources. Time, materials, and human resources can be essential for accomplishing many goals. Lack of resources can be a critical obstacle to a wide range of goals. Adverse circumstances. Students of all socioeconomic backgrounds may face adverse circumstances, such as illness, bullying, neighborhood violence, family difficulties, social alienation or racism, moving to a new school, and so on. It can be challenging to maintain focus and direction toward long-term goals in the face of such obstacles.While these categories are not meant to be exhaustive, they begin to point to the types of resources that students will need as they face big goals. Here we discuss two dimensions— cultural and tangible resources.Supportive and rigorous learning environment culture. The National Research Council 2003 report, Engaging Schools: Fostering High School Students’ Motivation to Learn, includes an extensive review of the research literature on how to set up learning environments to support motivation for the nation’s most vulnerable students. According to this report, cultures are supportive when they have the following characteristics: (1) they promote beliefs about competence, (2) they promote relevant values and goals, and (3) they promote social connectedness and belonging. Students will persist more when they perceive that they are treated fairly and with respect, and adults show they care about them. Students will persist more when teachers, administrators, and others in the school environment have high expectations for students’ success and hold students to high standards. These can be conveyed explicitly or implicitly. When remedial support is necessary, it is provided in ways that do not feel punitive or interfere with opportunities to engage in other interest-driven activities. Evaluation of student performance should be carefully designed not to undermine perceptions of competence and future expectations. It should be based on clearly defined criteria, provide specific and useful feedback, and be varied to give students opportunities to demonstrate competence in different ways. Extrinsic rewards and punishments that undermine intrinsic motivation should be avoided. Authoritarian discipline policies that limit students’ options and opportunities for self-expression undermine intrinsic motivation and persistence. Persevering in the face of challenges or setbacks to accomplish goals that are extrinsically motivated, unimportant to the student, or in some way inappropriate for the student can potentially induce stress, anxiety, and distraction, and have detrimental impacts on students’ long-term retention, conceptual learning, and psychological well-being. As grit becomes a more popular notion in education, there is a risk that poorly informed educators or parents could misuse the idea and introduce what psychologists call the “fundamental attribution error”—the tendency to overvalue personality-based explanations for observed behaviors and undervalue situational explanations. In other words, there is a risk that individuals could overattribute students’ poor performance to a lack of “grittiness” without considering that critical supports are lacking in the environment. Perseverance that is the result of a “token economy” that places a strong emphasis on punishments and rewards may undermine long-term grit; in particular, while these fundamentally manipulative supports can seem to “work” in the short-run, when students go to a different environment without these supports, they may not have developed the appropriate psychological resources to continue to thrive. In our interview with psychologist Carol Dweck of Stanford University, she discussed an emerging trend that many undergraduate students have developed the expectation that their decisions about their studies and professional direction must come from an inherent “passion”—rather than through the effort and work of fully engaging in what they are doing. While a rare few may be driven by specific passions, for many students, this expectation is false and can undermine their persistence when they begin to encounter challenges in a chosen direction.